Head of Zeus, bust of zeus, zeus, zeus statues, zeus sculptures, greek art, greek reproductions, greek gifts, greek, museum reproductions, greek statues, statues,greek sculptures. National Archaeological Museum, Athens. 450 B.C. 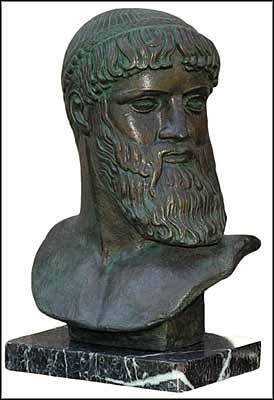 This bust is taken from the magnificent full figure which was first called Poseidon, God of the Sea. That identification is now questioned. The balance of evidence tilts towards Zeus, the Chief of the Olympian Gods, and this is now accepted by the majority of archaeologists. An arm of the statue was first found in 1926 under the sea in the remains of an old shipwreck north of Athens. The rest of the figure was recovered two years later. Many art historians believed that the statue was the work of Kalamis. Zeus ruled over the sky and all atmospheric phenomena-winds, clouds, rain and even the destructive thunder and lightning came under his command. Being ruler of the sky, he was venerated in lofty places such as mountain tops. The oak was sacred to him as was the thunderbolt and the eagle.